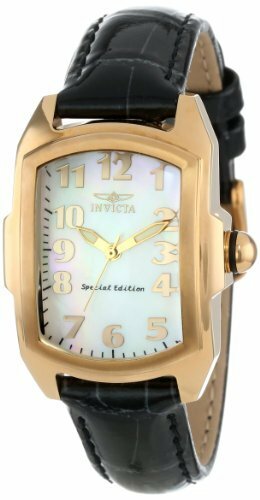 This women's Pro Diver by Invicta is a bold and classic timepiece. Covered by a unidirectional ion plated stainless steel bezel, this striking timepiece has luminous hands and an amazing 200M water resistance that allows for this versatile watch to be worn anytime of the day and event. Discover the elegant design and radiant sparkle of the Invicta Women's Wildflower Collection 18k Gold-Plated and Stainless Steel Watch. A round silver dial showcases gold-tone hands, a single gold Roman numeral at the twelve o'clock position, gold baton hour indices, and black minute indices. Holding a flame-fusion crystal to protect the dial, a stationary 18k gold-plated stainless steel bezel is encrusted with 24 shimmering white crystals. Adding even more shine, the matching two-toned 18k gold-plated stainless steel bracelet features 18 white crystal accents in a decorative cross pattern where the bracelet meets the case. This timepiece uses reliable Swiss quartz movement and is water resistant up to 165 feet (50 meters).Wildflower CollectionA summon to all stunning sirens. Ever true to the very essence of the source for inspiration, the Invicta Wildflower collection is most deserving of female attention. Capturing the contradictions of its muse, the timepieces of the Wildflower line are flawlessly integrated representations of elegance and strength. Realized with features including diamonds, gemstones, mother of pearl, textured or pave dials and Swiss movements, Invicta boldly embraced the paradox and has indeed found brilliance in the bloom. 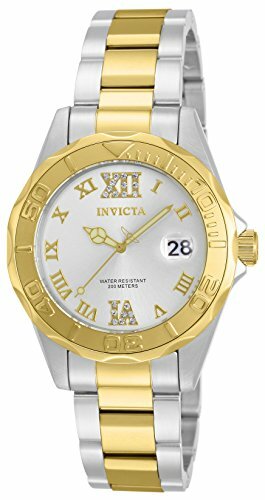 The sophisticated Invicta Women's Wildflower Collection 18k Gold-Plated Crystal Accented Watch offers a gold-toned dial with gold-toned, bar-shaped hour indexes, gold-toned hands, and a Roman numeral hour index at twelve o'clock. The minimalist dial is surrounded by an 18k gold-plated stainless steel bezel studded with sparkling, white crystals. The monochromatic look emphasizes the understated elegance of the timepiece. It continues with the 18k gold-plated, stainless steel bracelet with a jewelry clasp. Made from flame fusion crystal, the window is sturdy and scratch resistant, and the watch is water resistant to 165 feet (50 meters). Plus, it features precise Swiss quartz movement for accurate timekeeping.Wildflower CollectionA summon to all stunning sirens. Ever true to the very essence of the source for inspiration, the Invicta Wildflower collection is most deserving of female attention. Capturing the contradictions of its muse, the timepieces of the Wildflower line are flawlessly integrated representations of elegance and strength. Realized with features including diamonds, gemstones, mother of pearl, textured or pave dials and Swiss movements, Invicta boldly embraced the paradox and has indeed found brilliance in the bloom. A stylish watch with quartz movement is a pretty neat sight, and that's exactly what Invicta's Pro Diver collection offers. This timepiece has a stainless steel bracelet and case that exude class, along with a mineral crystal that protects the automatic movement. It also boasts 200M of water resistance, which is perfect for any aquatic activity. 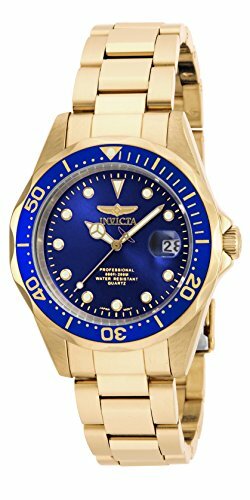 This Invicta Pro Diver watch features a blue bezel matching a silver dial. The petite design is perfect for any occasion. 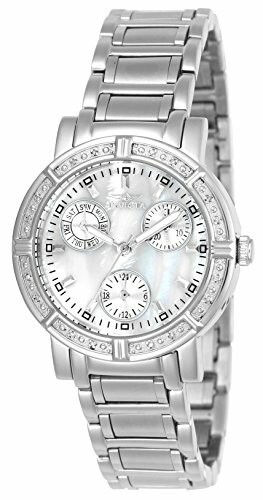 A perfect fusion of classic and modern look, this elegant women's Invicta Lupah timepiece completes any collection. Complete with an 18k rose gold plated stainless steel rectangle bezel to cover the exquisite mother of pearl dial while banded by a black genuine leather strap with croco finish, this fine timepiece is a must have. 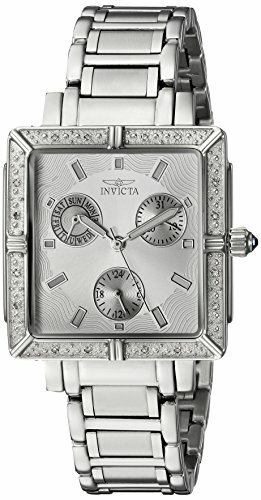 Compare prices on Watches Invicta Ladies at ShoppinGent.com – use promo codes and coupons for best offers and deals. Start smart buying with ShoppinGent.com right now and choose your golden price on every purchase.